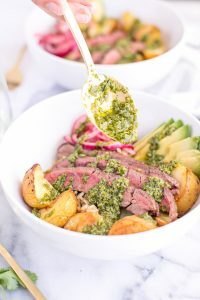 Using a classic Argentina chimichurri sauce, this recipe for chimichurri steak bowls is an easy, healthy dinner served up in a bowl with roasted potatoes, avocados and pickled red onions. 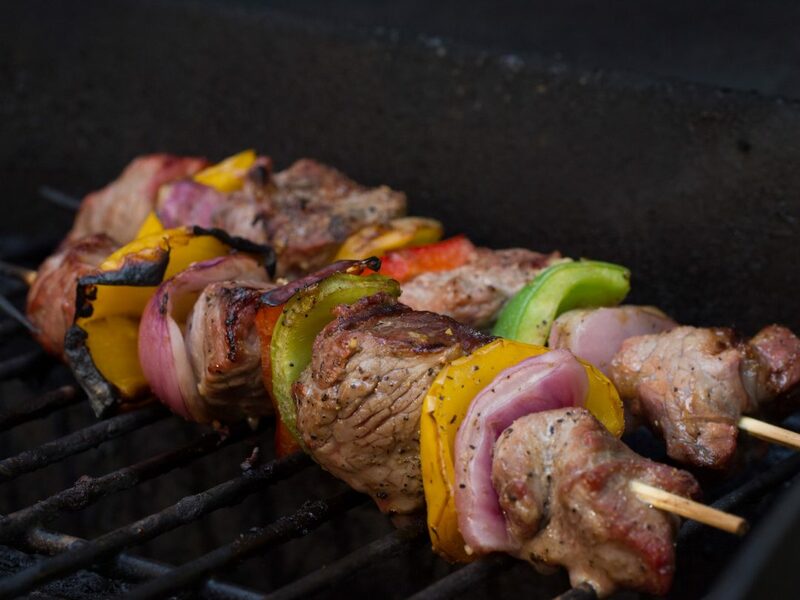 Rub 1 tablespoon olive oil into steak, and liberally season with salt and pepper on both sides. You can cook the steak on the grill or in a cast-iron pan. I recommend 5 minutes per side for medium-rare. Let rest for 5-10 minutes after cooking, and then thinly slice against the grain. Meanwhile, toss diced potatoes with 2 tablespoons olive oil and season with salt and pepper. Roast for 30 minutes, tossing halfway through. Evenly distribute cooked rice across 4 bowls. 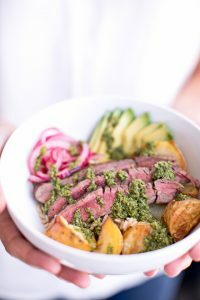 Top with steak, roasted potatoes, avocado and pickled onions. 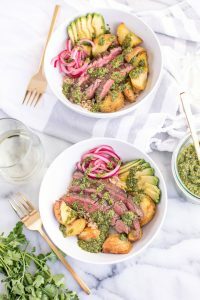 Drizzle chimichurri evenly across each bowl. Serve and enjoy! To make pickled red onions, simply slice a red onion and cover the slices with 2 tablespoons red wine vinegar and a teaspoon each of pink sea salt and organic coconut sugar. Toss and let sit for at least 5 minutes (30 is ideal; so you can make these before you start cooking and let them sit while you prepare the rest of the meal).